Kickstart – The upfront section with all the latest news, views and product reviews! Torque of the Town – We all love a DTC paintjob, it’s a classic… but this colour scheme is something special. Rally Report: Isle of Wight – For some this rally is the pinnacle of the season, for Serena… that certainly seems to be the case too! Rally Report: Oddballs – Shiver me timbers! Serena forgets to pack her favourite eye patch but still dives head first into the thick of the action at the pirate themed Oddballs rally. Rally Report: Great Yarmouth – Sarge braves the elements to bring us the best bits of the Sidewinders SC rally. Wild Thing – ‘Iconic’ and ‘evolution of the species’ just two of the well-deserved phrases which Stan has used to sum up the return of this stunning beast. Mailbox – Readers’ letters, laughs, feedback and fury – get it off your chest man! 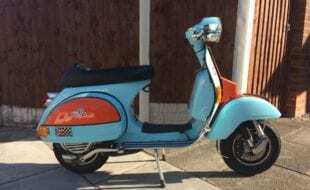 Show Us Your Scoots – The best of our readers’ rides this month as sent in by you. 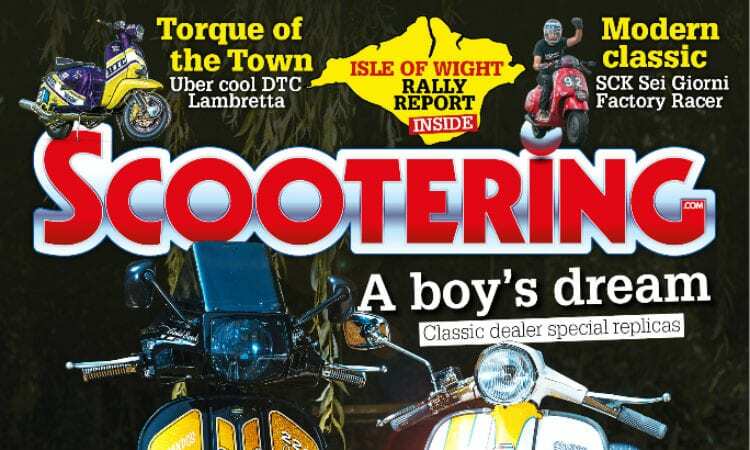 The ‘Coolest’ scooter ever – Stu Owen beings us another hidden gem from the past… The Cooler. 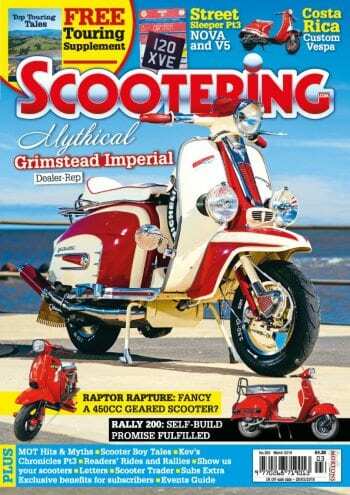 Reader’s Ride: Nosferatu – The much adored Vespa version of this blood curdling theme by Mike Davis. 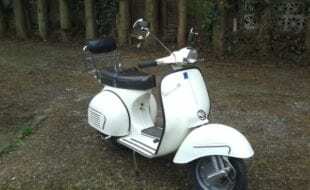 Dealer Focus – Sarge gets his hands dirty at the very well laid out and bursting at the seam premises of Surrey Scooter Services, and finds a rare Karslake treasure. Armandos and Arthur Francis Dealer Replicas – Unquestionably two of the most iconic names when it comes to dealer specials, owner Mickey has created his own versions of these classics… and they are stunning. 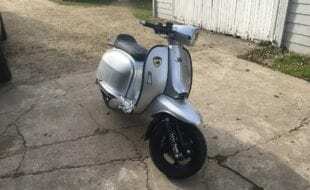 SCK Sei Giorni Factory Racer – Those clever men at Scooter Center have taken the modern GTV and worked their magic to create a factory racer replica. Club Do’s & Events – Your essential guide to the scene – What, Where & When! 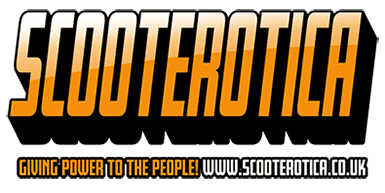 Scootering Words & Sounds – The best of scootering words and music as reviewed by Nik and Sarge. 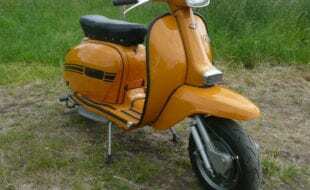 VCB Club page – Russ Machin brings us the latest news in the official VCB newsfeed. BSSO Report – Pembrey – Wales unleashed the worst of its weather on the BSSO racers, who were once again sharing track time with the cars of the Time Attack. Tech Torque: Build yourself a street racer – Stu Owen introduces our new series: his guide to building a street racer. An interview with… – Sarge tracks down Jonsey and Sheas of The Stone Foundation for a quick word. Patriot – I can feel the flurry of letters in the mailbox before this one is even printed! It’s nothing if not controversial… it’s Patriot. 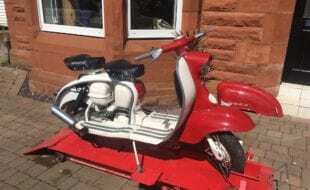 Scooter Trader – Your sales and classifieds section – including Specialist Services and At A Glance. 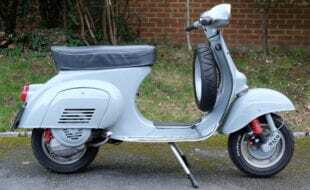 Dave’s Nostalgic Custom Corner – Nostalgia master Dave Oakley pulls out another stunning blast from the past – this month it’s the original and classic Nosferatu… Lambretta Style! 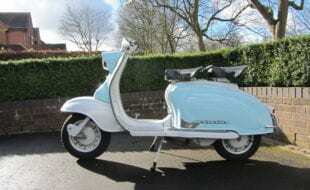 Reader’s Ride – Our favourite road ridden scooter this month, it’s always something special. This time it’s a British 50.